No matter the size of a business, the benefits of photos and personal identification are enumerable. From name tags to lanyards, most companies take advantage of these benefits. And, one of the easiest ways to identify an employee is through the use of photo ID badges. So, why use a photo ID badge? From name tags to lanyards, most companies take advantage of these benefits. And, one of the easiest ways to identify an employee is through the use of photo ID badges. First off, what is a photo ID badge? A photo ID badge with an employee’s name, photo, title and other relevant information is a great way to identify company employees. Fully customize each badge by selecting the orientation and fastener (deluxe magnet, pin, clips or a variety of other fasteners including punched slots with lanyards). One of the most important features of a photo ID badge is the security it offers. By providing employees with a picture as well as a name and title, it ensures that the proper people are entering and exiting your building. Quickly and easily identify someone with photos and provide safety and security while in the workplace. Safety is a primary concern for businesses. 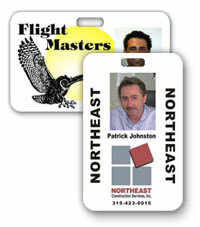 These ID badges can help keep restricted areas of your building safe and properly maintained. They can also keep guests from wandering, even accidentally, into areas that they shouldn’t be. And, keep your photo ID close at hand with the convenience of a lanyard or most any other fastener. They can also help with productivity! Employees can focus on what they need to do instead of worrying about being secure or if they are in the correct area on a job site. Add photos of an individual to each tag, along with their name, to make recognition easier. With a quick glance, anyone can see who that person is and make sure they belong on a project or in a restricted area. Public relations is also a concern for many businesses. Name tags and other personal identification products make establishing a relationship of trust not only easier, but simpler as well. Being able to quickly identify someone because they can match a face directly to a company is a refreshing and comforting necessity in our world. Photo ID badges are sure to fit the bill no matter your endgame with personal identification! Leave your employees, guests and clients with the benefits of these badges and a sense of security that you know what you’re doing!